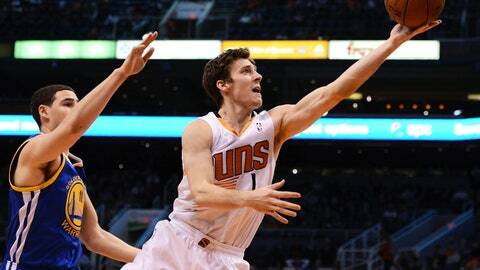 Goran Dragic goes up for a layup for two of his 21 points during the Suns' 106-102 win over the Warriors. Taking on the NBA’s most prolific backcourt, Eric Bledsoe and Goran Dragic more than held their own. Bledsoe scored seven of his 24 points in the fourth quarter and Dragic added 21 points to help the Phoenix Suns hold off Stephen Curry and the Golden State Warriors 106-102 Sunday night for their fifth straight win. "For this game, facing one of the best 1-2 punches in the game right now, it was a challenge," Bledsoe said. "We definitely feel good about ourselves." Bledsoe added eight rebounds and eight assists and Channing Frye added 20 for the Suns, who snapped a six-game losing streak against Golden State. Curry scored 30 points, including 20 in the second half, and Klay Thompson added 19 for the Warriors, who have lost three of four. David Lee added 18 points and 13 rebounds for his fifth straight double-double. "I am finding that the guys in the suit and tie want it more than the guys in uniform," Warriors coach Mark Jackson said. "It’s disappointing right now. We are going to be fine, but it’s disappointing to once again lose in the same fashion. "We see it. Everybody sees it. But I don’t see anybody in uniform with that same passion. Enough is enough at some point. We are watching the same movie every single night." The Warriors lost even though Curry and Thompson bettered their 44 points-per-game average and went a combined 6 for 11 on 3-pointers. "We think our guards can play with any of them," Suns coach Jeff Hornacek said. "Those are two great guards that they have on that team and our guys fought them all game." Golden State trailed by as many as nine in the third quarter, but pulled to within 76-75 on Curry’s 3-pointer that capped a 10-2 Golden State run. Maurice Speights brought the Warriors even for the first time since 3:41 of the first quarter, sinking a 3-pointer with 1:15 left in the third to knot the score at 81-all. But Golden State, which surrendered the lead for the final time five minutes into the game, could not pull ahead despite Curry’s best efforts. "They did a great job of fighting back in it, but we did a great job of staying solid," Bledsoe said. Phoenix opened the fourth quarter leading 81-80 and stretched the lead to six on Bledsoe’s jumper with 9:20 to go. Curry made it 92-91 on a 3-pointer with 7:49 left, but Marcus Morris hit a jump shot and added a free throw to stretch the lead to 95-91. Thompson made two free throws with 5:21 left to cut the Suns’ lead to one and had a chance to give Golden State the lead, but his 3-point attempt bounced off the back iron. Bledsoe and Frye then hit consecutive 3-pointers to put the Suns ahead 102-95 with 3:19 left. Curry answered with a long 3-pointer from the top of the key to make it 102-100 with 1:37 left. "With those guys, you never know," Dragic said. "Even when you’re up 15, they still can win the game." Curry missed a forced 15-footer with the shot clock running down while defended by P.J. Tucker, and Bledsoe made two free throws to secure the win. "He played good defense. I couldn’t get a shot off," Curry said. "I tried to draw a foul and get him up in the air, but he didn’t go for it." Tucker hit his only 3-pointer and Gerald Green added four points as the Suns closed the first quarter on a 10-4 run to take a 33-27 lead. Phoenix extended its lead to 59-46 with 1:27 left in the first half, but Curry scored five points to lead a 7-0 run that brought the Warriors back to 59-53 at halftime. NOTES: The Suns had three 20-point scorers for the first time this season. … Curry has scored 20 or more in 10 straight games. … Dragic has three straight 20-plus point games for the third time in his career and for the first time with the Suns. … Frye started the first half 5 for 5 from the floor, including 3 for 3 from beyond the 3-point line, until ending the streak on a half-court heave at the halftime buzzer. … Before the Warriors’ six-game winning streak in the series, Phoenix had won seven in a row. … Golden State F Andre Iguodala missed his 12th straight game with a left hamstring strain. The Warriors are 5-7 since his injury.